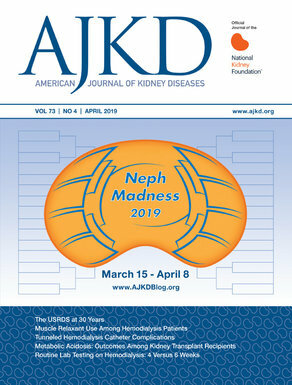 Fig 2 Najafian et al AJKD, © National Kidney Foundation. C4d staining is best done on frozen tissue. Formalin fixed tissue is satisfactory, but its sensitivity is lower with 10-30% of the cases reporting false negative results. It is because of this lower sensitivity that any degree of positivity is acceptable for making the diagnosis, whereas for frozen sections the minimal diagnostic threshold is set at 10%. It is also worth recalling that this threshold for diagnosis has been progressively lowered over the years. When the C4d staining technique was first described, only biopsies with >50% of positive capillaries were regarded as positive. If the sum of glomerulitis (g) and peritubular capillaritis (ptc) scores is >2, the need for C4d positivity can be bypassed. This rule is intended to allow diagnosis of C4d negative ABMR. However, ptc can be present in the more severe forms of T-cell mediated rejection. Therefore, it is recommended that if Banff grade 1B or higher rejection is present, a minimum g-score of 1 be a prerequisite for the application of this rule. Donor specific antibodies (DSA) are most commonly tested against HLA antigens only. If the clinical and pathologic suspicion for ABMR is strong, testing for non-HLA antibodies is recommended. Examples include antibodies to MICA/MICB antigens, angiotensin type II receptors, and endothelial antigens. Please visit the Atlas of Renal Pathology II at AJKD.org to view the installment on acute ABMR (freely available).